For being a netbook-fan I admit I am in the market for a super-slim lightweight laptop. The market has evolved, the current slimbooks are only slightly more expensive than netbooks, and I find the 13.3” screen size an ideal compromise between portability and straining my eyes with the tiny screens. 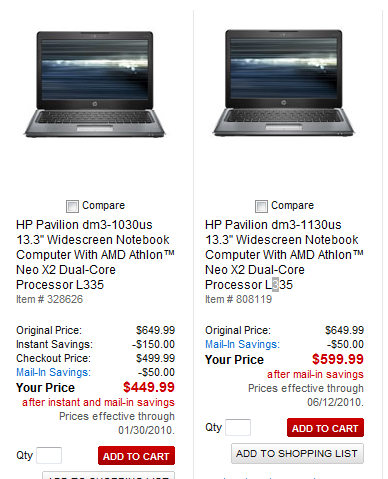 So I was quite happy to see what I consider a good deal: a HP DM3 for $449 @ Office Depot. I found it on DealNews a few days ago, but it became impossible to purchase almost immediately. I tried it for a few days, most recently just minutes ago, but am always getting the same response: no inventory. If this is not false advertising, I don’t know what is. CSR Gary has entered the session. Zoli: looking at item# 328626 – says no inventory. The same config available for $150 more under different SKU. But this one says price valid till Jan 30 – so how can I buy it? CSR Gary: Thank you for contacting Office Depot , Please give me a moment, while I check that for you. Zoli: Isn’t 808119 the same? CSR Gary: We sincerely apologize for any inconvenience caused. CSR Gary: Is there anything else I may assist you with? The 1030 unit is a previous generation and it looks like this sale was meant to blow out their inventory of their warehouse and stores and you are mad that they didn’t have enough to sell you? You are seeing the new model that was just produced and you want them to price match it. Withdraw the stick from your crevasse and get a life. The two models are identical – only a (Big) Monkey wouldn’t see it. In fact OD confirmed it themselves. This is not about how new / obsolete this unit is, and it’s certainly not about price-matching, either, it’s about OD refusing to sell existing inventory at the advertised price. Just a FYI they are NOT the same machine. They are different models with near identical specs. Depot is not to blame it’s the manufacturers that insist on having a new model released every quarter even if they make virtually no improvements. This happens every quarter at every big box retailer, old models get marked as clearance and sold off, while the new (possibly nearly identical) is higher priced. Also did you check your local stores instead of the online site? In my area about half of them still have new units of the $449 unit in stock, as a clearance item, and virtually all the rest still had the display which they were willing to sell at the $449 price. So if you’re looking for someone to blame, blame HP not the retailer, whoever it may be. I guess we can get philosophical about what is identical: these two units do have identical (not nearly but fully identical) components, and if you read the CS script, the rep acknowledges they are the same and the different SKU simply reflects pricing. The rep also checked in-store inventory and found nothing in the area. More importantly, next time you comment somewhere without disclosing your relationship with Office Depot, remember that it’s not enough to use gmail, your IP address gives you away. …and probably others but that’s as far from 94566 as I checked. Pricing remains @ $499.92 and the $50 mail-in rebate is valid through 6/12. I know this doesn’t address your complaint, but if you’re still trying to purchase that particular laptop I wanted to let you know where they are available in your area. Why delete my comments? because its true? Dont put up comment options on an article if you want the world to only see your side of it. 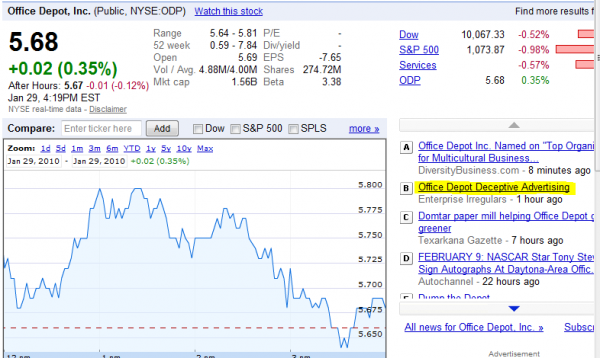 Zoli I do work for office depot also and what do I care if you have my IP address. Thanks to mike for helping Zoli see their is product in his area and perhaps he can go pick one up instead of crying for the world to see. I expect the internet generation to be a little short tempered but you do need some help. I didn’t say weither I worked at Office Depot one way or another because I was offering my personal opinion, nothing more and didn’t belive it mattered. Not that I was trying to hide anything. I would have offerend the same opinion if the retailer in question was Best Buy, just less likely to see the article. Now as someone how works at Office Depot but in no way represents them in any official capacity publicly, you did pirque my intrest so I did some research by talking with my HP rep in case a customer asked the question and discovered that there is a actual hardware difference between the two models. I’ll admit it is a slight differnce, in that the 1130us has a better quality video card with 128MB of dedicated memory on the video card, or in HP’s words “128MB Display Cache Memory” while the 1030us is entirely shared memory. Btw, I also received email contact from Executive Customer Relations – kudos for listening.